located along the river LOT and practically in the town center will be your home port. You are a 7-minute walk from the Town Hall (city center). On its large terrace you can enjoy boating, the VALENTRE Bridge and its illuminations at night. You will easily find to park around the residence. Apartment sunny, bright, well conditioned équipé.Sa s main room opens onto the terrace, the room overlooks the Lot. The decor and furnishings were treated. The bathroom has a closed shower. It 'a city' ART AND HISTORY ', labeled' REMARKABLE GARDEN ', by the Ministry of Culture and Communication, its gardens are very neat. Cahors is located at the crossroads going to Saint-Jacques -de Compostela. The VALENTRE PONT SAINT ETIENNE and the cathedral are registered in the directory UNESCO n 'wait to discover them. The deposit or security deposit is settled on arrival (returnable), or 150 € in cash or check payable on France. Rentals are from Saturday to the next Saturday (s). We loved the apartment, it was equipped with everything you could conceivably need for an extended stay in one place. Very efficient air conditioning which was definitely needed this year with the temperature being in the thirties for almost the entire time we were there. Cahors is a beautiful city with some great restaurants and surrounded by the magnificent Lot valley and the hundreds of beautiful villages, fantastic vineyards and historical sites. We loved it and will return to our fabulous apartment again next year hopefully. We loved the view of the river Lot and the beautiful Pont Valentre bridge, and the town centre was only a 10 minute walk away, so the property was very well placed. Parking was outside the flat, free and we always found a space easily. Inside the property was quiet but there is a hydro unit outside the balcony which does generate some noise. Not really a problem for us as we were there in February so didn't use the balcony much. The studio flat itself was comfortable and clean, and the kitchenette well equipped. The owners were friendly and helpful and left us with a bottle of local wine - very nice! All in all a good base for a couple wanting to explore Cahors and the region. 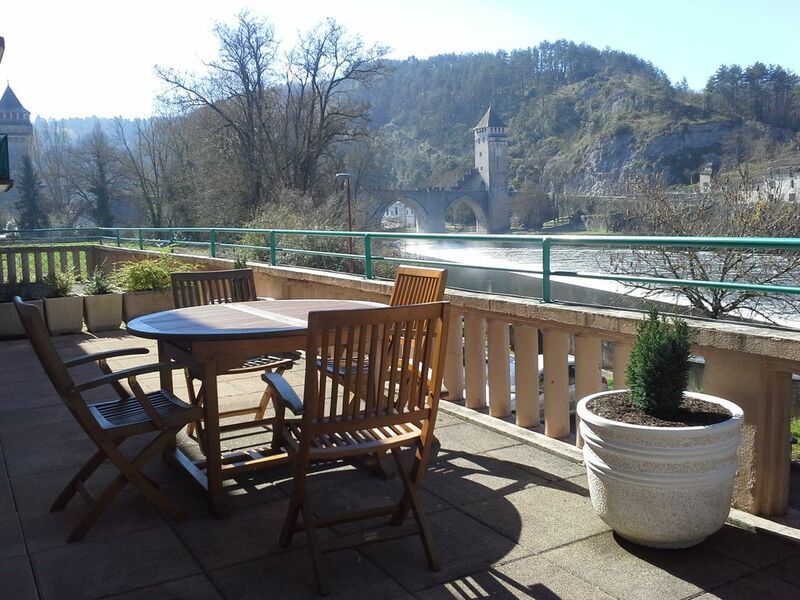 We are happy knowing you have liked your stay in Cahors. Perhaps, see you other time, later. The balcony and apartment were about equal in size. The apartment was comfortable and had most of the amenities...a reading lamp or 2 in the living room would have been useful. Please remember to bring your own towels, as they are not provided, unless you pay. The bedroom is not a separate room, but off of the living room space, separated by a partial wall. The area around the apartment was under construction, the hydro plant with its associated hum was directly in front of the apartment, but the view of the Verendrye Bridge was a bonus. Cahors is a good home base for exploring the region and visiting the many hilltop medieval towns in the vicinity. Excellent location; good value; helpful owners. We enjoyed our one-week stay here and would recommend it to others. The apartment, which is on the first floor and accessed by an internal, communal staircase is clean, relatively small, but adequate for a short period. It's in an excellent location for exploring Cahors by foot and the wider area by car or train (free car-parking is available close by and the station is within easy walking distance). The kitchen is basic; the small, double bed is hard and quite challenging. Within a short walk are shops, cafes, restaurants and tourist sights. The owners went to great lengths to be helpful. A large west-facing terrace has a lovely view over the Lot river and Pont Valentre - a good place to spend the evening with a drink watching the sun go down, even though it lacks privacy from adjoining neighbours. There is some ambient noise outside the apartment, but inside it is very quiet. All-in-all, a good value, no-frills apartment, in an excellent location. It is ideal for one person or a couple on a budget looking for a quiet stay in a fascinating part of France. this is a clean, well equipped, compact flat, big enough for two people. Its selling point is the large, south facing balcony with a lovely view. The area round about needs renovation and as a 4 star hotel is being built nearby this is expected to happen. It is only a short walk from the centre of Cahors, a beautiful town and for longer walks just keep going!! I would definitely recommend this property. Hard to find a better place to stay in Cahors, magnificent view of the Pont Valentr'e , Weir and the river from the spacious balcony while dining or enjoying a drink, our host's Alain & Nelly looked after all our needs in this spotless and very well maintained apartment, with free parking at the door, restaurants, a boulangerie a few steps away and a five minute walk to town what more could one ask, yes we would highly recommend this property as we thoroughly enjoyed our stay, and if you need two bedrooms, Alain & Nelly can accommodate you next door. It seems fair to point out that major development works of Lot banks will be under way in spring 2016.